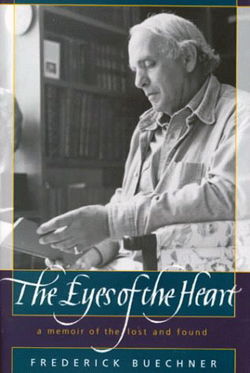 No writer of spiritual matters has meant more to me over the years than Frederick Buechner, Presbyterian minister, theologian, novelist, essayist, memoirist, lecturer, as evidenced by the fact that I seem to have two of everything he’s ever written other than his novels. Now that my memory is swaying in the wind, I seem to buy his books whenever I see his name, so sure I am of the blessings that await inside. Last week’s mail brought two: Listening to Your Life, daily meditations collected from Buechner’s work by George C. Connor, Professor emeritus from the University of Tennessee at Chattanooga; and The Eyes of the Heart: a memoir of the lost and found. The book of meditations was already on my shelf, alas, and will now go to the first person who wants it, but the joy I found in The Eyes of the Heart was so uplifting that I kept reading passages over and over. It further emphasizes why I think that we should all leave memoirs around for our children and grandchildren. It is, however, his invitation to explore his ”magic kingdom,” the place where he works and keeps his treasures, his memories of family and friends, his history, both secular and spiritual, that is so fascinating to a reader. He explores in detail the books that have meant the most to him and those I have not read, I dutifully marked for reading. For the book lover, there can be no finer hour than one spent in discussing books with someone who loves them equally well: a magic kingdom indeed. A major blessing, grace given, Buechner says, is that each family is its own magic kingdom. And that “if you look at it through the right pair of eyes it points to a kingdom more magic still that comes down out of heaven prepared as a bride adorned for her husband. The one who sits upon the throne says, ‘Behold I make all things new’….” Undergirding all we fear, says Buechner is “the everlasting arms,” spoken of in Deuteronomy, that are there to hold us up in the times when all we fear seems to break around us. You will love this book.